The Internet of Things (IoT) has rapidly transformed the digital landscape and the world we live in. Intelligent devices and sensors connect smart cars, robotic manufacturing equipment, smart medical equipment, smart cities, industrial control systems, and much more in a way that improves lives and saves businesses billions of dollars. But along with its benefits, rapid IoT growth introduces a new dimension of security vulnerabilities that dramatically escalates the nature and seriousness of cybercrime risks. • Threaten lives through hacked pacemakers and other medical devices. 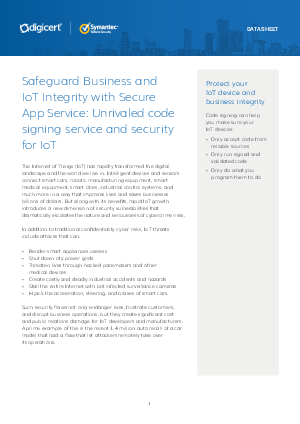 Such security flaws not only endanger lives, frustrate customers, and disrupt business operations, but they create significant cost and public relations damage for IoT developers and manufacturers.